Epiphone introduces the FT-350SCE Acoustic/Electric, the world’s first affordable self-tuning acoustic/electric guitar and featuring the fast, easy, and dependable Min-ETune™ system that gets you in tune quickly and accurately at the touch of a button. For over a century, Epiphone has led the way in designing professional affordable instruments. Artists like The Beatles, Gary Clark Jr, and Zakk Wylde have counted on “House of Stathopoulo” acoustic guitars to set trends and make history. And now with the new FT-350SCE Acoustic/Electric guitar, Epiphone combines decades of superior acoustic design with the revolutionary Min-ETune™ system that will change the way beginners and professionals see and hear their guitar. For metal, rock, blues and country guitarists who are used to bringing multiple guitars on stage for songs that require open tunings, Min-ETune™ eliminates the hassle of long pauses in between songs or even the need to bring all that extra gear. Your Min-ETune™ comes with 12 popular preset alternate tunings. And in addition, you can also program up to six additional tunings yourself. 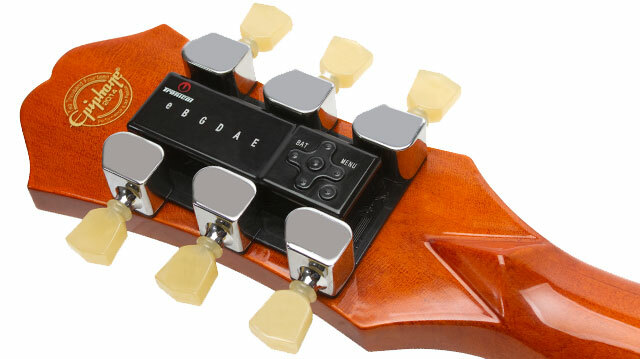 You can even adjust your guitar’s tunings to match other instruments such as a piano. The Min-ETune™ system is nothing short of revolutionary. With the addition of the new Tronical SpeedNut™ that solves the age-old problem of string slippage and intonation, now there’s nothing between you, your instrument, and the audience. And what better way to introduce the new Min-ETune™ system than an acoustic guitar designed and built by the “House of Stathopoulo,” a leader in designing the modern acoustic guitar. Meet the FT-350SCE acoustic/electric. The Epiphone FT-350SCE Acoustic/Electric’s Min-ETune™ comes with 18 preset tunings including 12 factory presets and 6 user programmable presets. The factory presets alone cover all the classic blues, rock, country, and metal tunings including Standard E, DADGAD, LOW D, DROP D, Eb, DOUBLE DROP D, OPEN E, OPEN A, OPEN D, OPEN G, DOBRO, and ALL 4th tuning. Save time and money in the studio, keep the flow going on-stage, and enhance your creativity with new tunings. Alternate tunings are hard to master, especially for new players, but Min-ETune™ gets you in and out of 12 custom tunings in seconds. You can even tune to instruments like piano that might be slightly off of standard pitch. You take care of the playing—we’ll handle the tuning. Just push a button, strum, and your perfectly tuned FT-350SCE is ready to rock, write, or record. Min-ETune™ tunes all six strings simultaneously in seconds. Spend time playing--not tuning. (Your audience will thank you, too.) There are other automatic tuning systems that work by digitally synthesizing the sound of a tuned string. But Min-ETune™ tunes your physical strings—no tricks and no digital processing. You’ll never hear one pitch coming out of your speakers and a different pitch coming out of your guitar. With Min-ETune™, what you play is what you hear. As with all Epiphones, the FT-350SCE Acoustic/Electric comes with Epiphone’s Limited Lifetime Warranty and 365/24/7 Gibson Customer Service. The future has arrived. And the future is in tune! Play a new Epiphone FT-350SCE Acoustic/Electric with Min-ETune™ at your Authorized Epiphone Dealer today. You take care of the playing—we’ll handle the tuning. The body top has white and black 10-layer binding with 2-layer white and black binding on the back and a single layer of white binding on the fretboard. The Sloped Dovewing headstock has a 60s era “Epiphone” logo in Pearloid, the same design found on classic Epiphones like the Texan and Casino. A special “2014” logo is also on the back of the headstock and the 2-layer black and white “bullet” style truss rod cover has a 60s style Epiphone “E” in white. The FT-350SCE comes in Antique Natural, Ebony, Violin Burst, and Wine Red color finishes. The FT-350SCE Acoustic/Electric is powered by a Shadow® ePerformer™ preamp and a NanoFlex™ Under Saddle Pickup System. Epiphone and Shadow Germany have worked together for over a decade at perfecting ways to amplify an acoustic guitar on stage so it sounds like an acoustic guitar no matter what your stage volume. The combination of the Shadow® ePerformer™ Preamp—featuring a wide range of eq options--and the NanoFlex™ under saddle pickup gives you unlimited control of the FT-350SCE on stage and in the studio. Controls for the FT-350SCE’s Shadow™ ePerformer™ Preamp are on the upper bout and include controls for Master Volume, Bass, Treble, Phase, Mute, and an adjustable Dynamics control. There is also a low battery indicator. 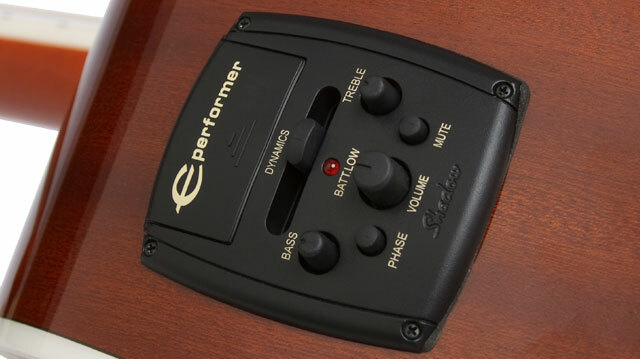 The Shadow™ ePerformer™ preamp is powered by two 2032 Lithium Ion Cell batteries. The output jack and strap locks are nickel and the FT-350SCE’s is strung at the Epiphone factory with time-tested D'Addario Phosphor (12-53) strings. The new Epiphone FT-350SCE gets in tune and stays in tune thanks to the Min-ETune™ system with vintage style keys with a 40:1 tuning ratio. The revolutionary Min-ETune™ is the only proven system to keep your guitar in tune and automatically tunes to standard pitch as well as open tunings quickly and accurately. Any Epiphone guitar with Min-ETune™ feels the same, looks the same (the unit mounts onto the back of your guitar’s headstock), and plays the same. But most importantly, your guitar also sounds the same since Min-ETune™ works by tuning the actual strings, not by digital trickery that degrades your tone.